Andreas de Mare built the first organ in St. Ludgeri, Norden in 1566–67. 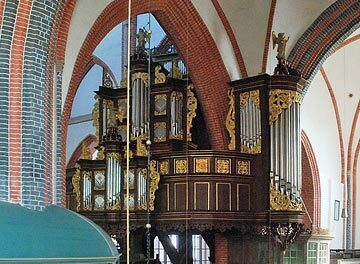 After the church and organ were severely damaged by war in 1602 Edo Evers of Emden rebuilt and expanded the organ. In 1686–88 Arp Schnitger built a new organ of 35 stops including 10 from the previous work of de Mare and Evers. Shortly after completion, Schnitger added an Oberwerk of 8 stops playable from the top manual (Brustwerk) and facing diagonally into the choir area. The final organ after other additions to the original specification contained 46 stops and was and still is the largest organ in Ostfriesland. The organ remained largely unchanged until the middle of the 19th century. Miscellaneous changes over the next 100 years saw all of the reeds replaced, the façades destroyed for the war effort, and all but one mixture thrown out. A complete restoration was carried out by Jürgen Ahrend of Loga-Leer in 1981–85 including 25 new stops based on surviving Schnitger examples.